Barring unusual circumstances, bathing your teddy bear hamster is a strict mistake. Your teddy bear hamster tends to her own hygiene just fine; bathing strips these long-haired Syrian hamsters of natural oils they need on their skin and coat, and it puts them at high risk for becoming too chilled -- which can easily turn fatal. If she gets something sticky in her hair, carefully snip it out if possible. If not, or if your hamster becomes soiled by a toxic substance she can't lick off or can inhale, a quick bath may be necessary. Consult your vet before you do. Fill a container or bowl with a few inches of lukewarm water. Never use cold or hot water, and don't make assumptions; test the water yourself right before you use it on your teddy bear hamster. Get the water when you're ready to use it so it doesn't cool down. Hold your hamster gently but securely in one hand. Dip part of a soft washcloth into the water. Gently rub the wet portion over the spot on your hamster you need to clean. Because teddy bear hamsters have longer hair than other types, you may need to use your fingers to move the hairs around to thoroughly wash off the dangerous substance. Avoid getting your hamster's ears or face wet. Add a small drop of baby shampoo into the water if water alone doesn't clean your teddy bear hamster adequately. It's even more important to keep shampoo away from her ears and face. 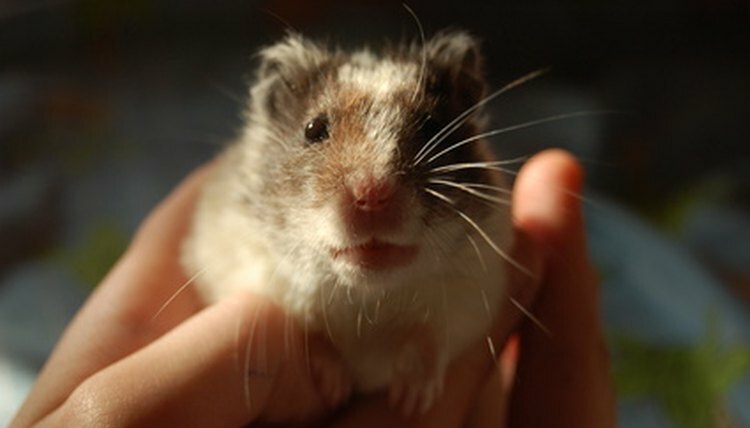 Use a clean, wet washcloth to gently remove the shampoo from your hamster's fur. Blot the wet area of your teddy bear hamster with a clean towel to begin drying her long hairs. If your hamster is significantly wet, turn a blow-dryer to its lowest force and heat settings. Use it from a distance briefly to dry the wet area. Don't blow air into the hamster's face or ears. Let your hamster air-dry fully in her playpen or another hamster-safe enclosed area before returning her to her cage. If she goes back in the enclosure still damp, her bedding, feces, food and other material will stick to her.  If it's cold, turn up the heat before you bathe your teddy bear hamster.  Dust baths made from different types of fine-grain sand are commercially available for hamsters. Opt for an all-natural product and follow the package directions carefully. Pour the specified amount of the product into a shallow bowl and let your hamster play in it. This should take place in your pet's playpen or other safe enclosed exercise area. Most of these products are safe for use every few days, but check the label to be sure.